Today'splanned inaugural flight of the new private Falcon 9 rocket built by theentrepreneurial firm SpaceX is a high-stakes endeavor. Asuccessful liftoff of the privatetwo-stage booster, planned for today at 11 a.m. EDT (1500 GMT) from Florida'sCape Canaveral Air Force Station, would put oomph into President Barack Obama?s plan tooverhaul NASA by using commercial firms to send crew and cargo to theInternational Space Station. Buta Falcon 9 failure could be construed by some as a cautionary flag, calling toquestion the readiness of entrepreneurial ?NewSpace? muscle to energize a commercialspaceflight industry. Therocket's makers stress that this test flight should not come with too-highexpectations. "100percent success would be reaching orbit," SpaceX founder and CEO Elon Musktold reporters during a Thursday teleconference. "Given that this is atest flight, whatever percentage of getting to orbit we achieve would still beconsidered a good day. If just the first stage functions correctly, it?s a goodday. It?s a great day if both stages function." Forpromoters, the Falcon9?s maiden takeoff test signals a sea change. Yet there are those whosuggest wearing life preservers. 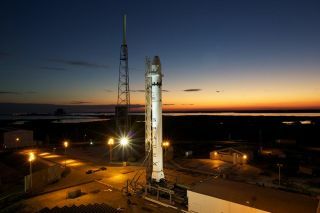 Politicalsupport for Obama administration's push to rely on commercial space companiescould be strongly affected by the success or failure of the Falcon 9 test, saidRoger Handberg, a political scientist at the University of Central Florida whohas written extensively on space policy. "ForObama, there's a lot riding on it, as far as his credibility, because that?shis big option," Handberg said. Obama visited SpaceX's Cape Canaverallaunch site and toured the Falcon 9 rocket pad in April. Infact, some say there's too much pressure for SpaceX to perform during this maidenlaunch. "Certainlythe future of the company and the future of the industry doesn?t ride on thistest," said Brett Alexander, president of the Commercial SpaceflightFederation, a private industry group. "Some people are making it out to bethat big, but it's not." Allin all, it?s a touch of faith-based rocketry. ?We?vewaited long enough. The field now of NewSpace is broad enough that it would befoolish to hang everything on one launch,? said Rick Tumlinson, co-Founder ofthe Space Frontier Foundation and a long-time space activist. ?We?renewbies in a sense. We?re going to have failures. Stuff is going to blow up,?Tumlinson said. ?Anybody on the NASA side who tries to pin it on us is beingdisingenuous?because all we have to do is roll their old tapes,? he toldSPACE.com. Tumlinsonportrays the coming of age of NewSpace as akin to barnstorming in earlyaviation. He stressed the need for the public to understand that this isn?trich boys and their toys ? there are bigger things at stake. ?Whetherone vehicle blows up or not?at least the SpaceX rocket is a real vehicle asopposed to a fake like the NASA?s Ares [launch] was,? Tumlinson said. SpaceXhas a $1.6 billion contract with NASA to deliver 20 tons of cargo to theInternational Space Station over 12 Dragon flights through 2016. Thecompany plans to offer Falcon 9 rocket flights at prices ranging between $45million and $52 million. This SPACE.comgraphic shows how the Falcon 9 rocket compares with NASA's shuttles andother spacecraft. Todate, the Hawthorne, Calif.-based company has invested about $400 million inits Falcon rockets (including the smaller Falcon 1) and the Dragonspacecraft, Musk said. Falcon9 working correctly right out of the box is not likely, observes Tim Pickens, acommercial space advisor for the Huntsville, Ala.-based Dynetics and also thesenior propulsion engineer for the company. ?Idon?t think a first-launch failure is the end of the world,? Pickens said. ?This is the launch business?and I?m rooting for these talented guys.? Pickenssaid that what SpaceX has on his side is history ? a history of boosterdevelopment over the decades that provide many lessons learned. Still, giventhe complexity of the Falcon 9, he said, there?s likely to be more lessons tobe learned lurking within the booster. ?Thekey thing is that there?s enough instrumentation onboard. If something doeshappen, they can correctly fix it,? Pickens added. ?The biggest fear is nothaving the data to support whatever failure mode you did have? which could meanyou end up in a pretty lengthy investigation.? Witha vehicle the size of Falcon 9, particularly its nine main engines, ?there area lot of dynamic things happening. Of course the staging event is always thebig one,? Pickens noted. Muskhas said the first Falcon 9 rocket has about a 70 or 80 percent chance ofsuccess for its debut, but SpaceX can survive if it fails. A second Falcon 9rocket is already being prepared for a follow-up test later this summer. "They'resmart people so they have a business plan that doesn?t assume a 100 percentsuccess," said John Logsdon, a space policy expert and professor emeritusof Political Science and International Affairs at the Space Policy Institute atGeorge Washington University in Washington, D.C., on Thursday. "So iftomorrow is not a total success, they will move on." Shouldthe hopes of the entire industry and political survivability of PresidentObama?s plan for NASA ride on one rocket flight? ?No?it?s a test program,? responded Michael Mealling, vice president of business developmentfor Masten Space Systems in Mojave, Calif. The few flight anomalies thatcropped up in NASA?s AresI-X flight in October of last year, Mealling said, didn?t prove that Ares Iis not a viable rocket. It was a learning experience, he said. ?Ifit goes right the first time, you actually didn?t learn anything,? Meallingtold SPACE.com. Regardlessof what happens with the first flight of Falcon 9, SpaceX spent a tenth of themoney doled out by NASA on its Ares booster, Mealling said. ?Yes, I know thatit?s an apples-and-oranges comparison, but apples and oranges do generally costthe same amount at the grocery store.? ?IfFalcon 9 leaves the tower under its own propulsion, does even 75 percent of itsgoals, I think it will make a point that commercial companies can movefaster?they can move cheaper?and that will start to make a point,? Meallingadvised. Meallingsaid that there are people looking for a ?Netscape Moment? in the commercialspace industry, the equivalent of the first Internet investment boom forprivate spaceflight. ?Rocketengineering doesn?t work that way. There?s a lot of incremental stuff. Youprove things out,? he concluded. Interms of the bigger picture of upstart NewSpace ventures and the commercialspace business, the future is indeed exciting - but also terrifying, insiderssay. That?sthe view of Jeff Greason, President of XCOR Aerospace in Mojave, Calif. ?I?mnot sure we?re ready to do all the things that the U.S. government is nowdepending upon this industry to be able to do. That?s just too bad, becausewe?re going to have to do it anyway.? Inremarks at the Space Access Society?s Space Access '10 conference held in earlyApril in Phoenix, Greason bluntly advised a room full of space entrepreneurs:?It is time to grow up.? Greasonwas a member of the recent White House-requested Review of U.S. Human SpaceflightPlans Committee. That review spotlighted the fact that there is now aburgeoning commercial space industry. ?Ifwe craft a space architecture to provide opportunities to this industry, thereis the potential ? not without risk ? that the costs to the government would bereduced,? the report advised. ?Commercial services to deliver crew to low-Earthorbit are within reach. While this presents some risk, it could provide anearlier capability at lower initial and life-cycle costs than government couldachieve. A new competition with adequate incentives to perform this serviceshould be open to all U.S. aerospace companies.? Speakingat the Space Access Society gathering, Greason made clear his vision of theUnited States having a successful commercial space industry and spacetransportation industry. That enterprise, he said, would move people andpayloads to and from destinations in space with economics that make sense?witha level of safety and reliability that is associated with transportation andnot ammunition. ?It?sa hard road? it?s a long road. But we?re getting there. The size of theopportunity that we?re faced with is terrifying? and wonderful,? Greason said. SPACE.commanaging editor Tariq Malik and senior writer Clara Moskowitz contributedreporting to this story.